This week Alastair, Matt, and I get into the issue of time and how it affects our spiritual life. I’m not gonna lie, this one was pretty fun. We jump into everything from Augustine, to the musical nature of keeping time, the various spiritual dimensions to our awareness of time and eternity, and we manage to avoid speaking about A-Theory and B-Theory, which I’m sure everyone will thank us for. I hope you enjoy this one. And if you do, feel free to share it. GQ ran a fascinating article last month entitled, “What Would Cool Jesus Do?” It was essentially a long-form investigation of Hillsong NYC, trying to figure out the phenomenon that manages to pull in thousands of young, cool New Yorkers including people like Justin Bieber and Selena Gomez. 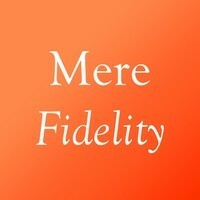 We figured that was worth discussing, so Matt, Alastair, and I took it up in this episode of Mere Fidelity. T his last week, Alastair, Andrew, Matt, and I took up a discussion through John Barclay’s new book, Paul and the Gift. Three of us (Alastair, Andrew, and I) have already read and reviewed the book, but we wanted to delve deeper into what we found though-provoking, ground-breaking, unhelpful, and so forth. We touch on issues of Pauline theology, grace, Barclay’s thesis in particular, and theological method with a few sparks flying in the midst of it all. A very lively conversation, if I do say so myself. We hope you enjoy. And after six days Jesus took with him Peter and James, and John his brother, and led them up a high mountain by themselves. And he was transfigured before them, and his face shone like the sun, and his clothes became white as light. And behold, there appeared to them Moses and Elijah, talking with him. And Peter said to Jesus, “Lord, it is good that we are here. If you wish, I will make three tents here, one for you and one for Moses and one for Elijah.” He was still speaking when, behold, a bright cloud overshadowed them, and a voice from the cloud said, “This is my beloved Son, with whom I am well pleased; listen to him.” When the disciples heard this, they fell on their faces and were terrified. But Jesus came and touched them, saying, “Rise, and have no fear.” And when they lifted up their eyes, they saw no one but Jesus only. And as they were coming down the mountain, Jesus commanded them, “Tell no one the vision, until the Son of Man is raised from the dead.” And the disciples asked him, “Then why do the scribes say that first Elijah must come?” He answered, “Elijah does come, and he will restore all things. But I tell you that Elijah has already come, and they did not recognize him, but did to him whatever they pleased. So also the Son of Man will certainly suffer at their hands.” Then the disciples understood that he was speaking to them of John the Baptist. The Transfiguration is one the most enigmatic and suggestive episodes in all the Gospels. This week on Mere Fidelity, Alastair, Andrew, and I had a truly fascinating conversation on the Transfiguration from biblical and theological perspectives. It’s one of my favorite discussions we’ve had in a while. I hope this conversation is as much of a blessing and challenge to you for it was for us.